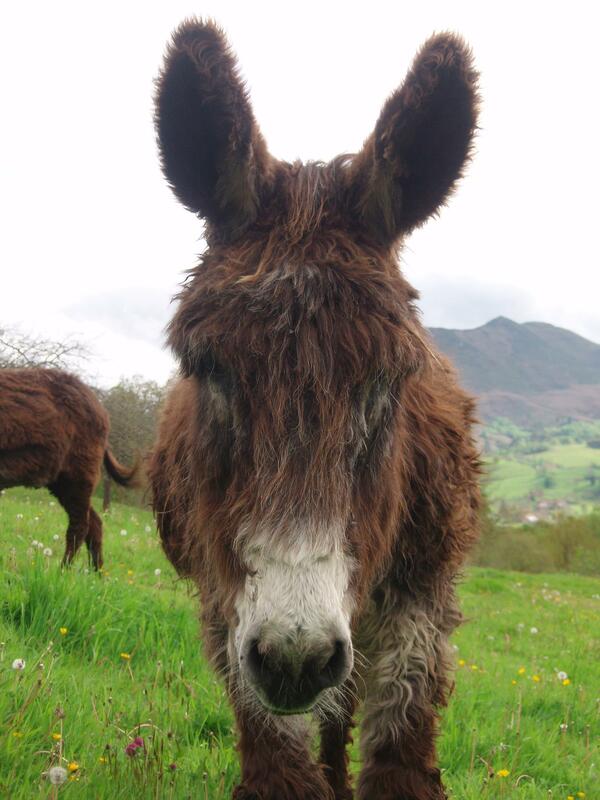 An air of sadness crept across the Asturian valley today (January 2012) in Paraiso Del Burro, where Ricky a small grey and white donkey lay in a very weak and sick state. In the few weeks leading up to this, Marleen had noticed that Ricky did not seem himself at all. Leading up to this time, when the vet was finally able to diagnose the illness which Ricky had, we had to give Ricky extra care and attention. 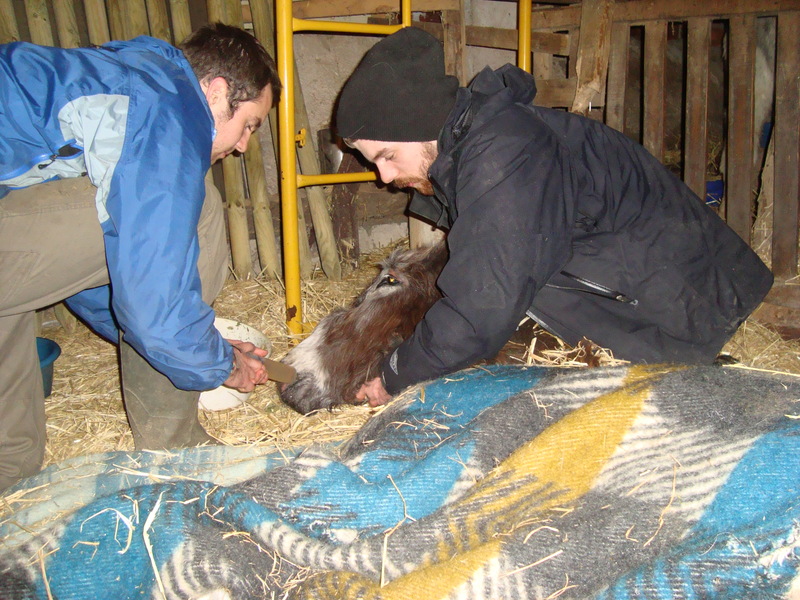 We had to feed him extra bowls of food, iron supplement and even put a fleece blanket wrapped around him at night time to keep him warm. Ricky seemed to be doing well and appeared from time to time to be getting stronger. He was kept in the front garden during the day so we could keep a better eye on him. One of the volunteers here called Judith would bring him for gentle walks around the field. He even helped in eating the grass in the herb and flower garden, which was very funny as one day Marleen said “we will give Ricky whatever he wants in the aid of him getting better'”. Later that day he was in the garden munching away but at the same time standing all over the flowers and herbs. Normally we would lead a donkey out of there to be in another part as there is ample room for them to wander around here, but for Ricky it was more than acceptable as it was good to see him moving around and exploring to see what he could find to eat. We kept going with the daily routine of getting Ricky well and making good progress. He seemed stable and was eating well. Then one day he dropped and became very weak in a short space of time. Marleen called the vet as we were doing everything beforehand to help Ricky but couldn’t understand why he got worse again than ever before. The vet could see no immediate signs as to what was wrong so he took a blood sample. 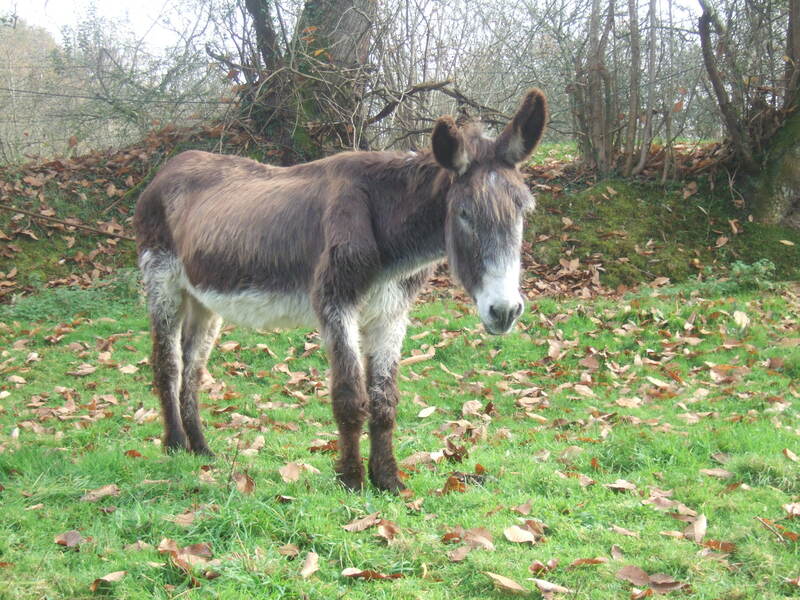 The results came back and it seemed that Ricky had Babesia (Piroplasmosis) a disease which can be found in donkeys, mules and horses. It is primarily transmitted by ticks and once infected it can take 7 to 22 days to show any signs of illness. Babesia can be mild or acute depending on the virulence of the parasite. It can be treated with medication depending on the stage of illness but this is not always possible if it is too far into illness. For the next four days Ricky was given injections. 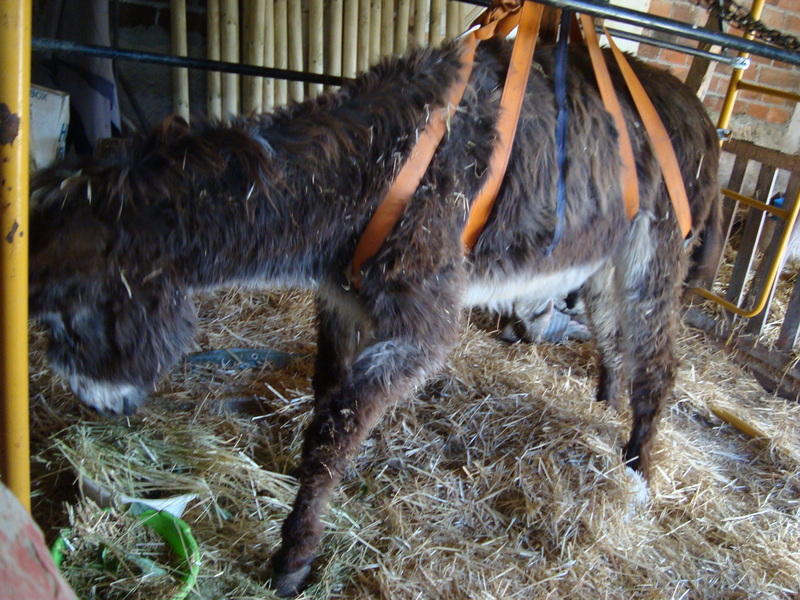 We had to elevate him with the use of a hammock tied with a belt to a wooden beam of the stable. This had to be done as Ricky could not stand by himself now or even sit. Every morning and evening he was lifted up for about 45 minutes to 1 hour. We had to massage and rub his legs to get his circulation moving but also had to be careful of the open sore spots which started to appear on his body especially on the legs. While he was elevated he was given something to eat and drink. He loved cabbage leaves and Brussels sprouts and this was included along with grain, apple, carrot, ginger, bran and foraca straw(oat straw). He had never any problem with his appetite and this was a good sign. I think we thought that Ricky may get better but after three days he still appeared to be so weak. On the fourth day I think we all knew that Ricky would not be ok and the vet was called again to come and see him. Marleen spoke to the vet and asked all of us what we thought would be the best thing to do. Ricky was not going to get better and it was unfair to keep him going with having to be elevated, moved and having to sit him up to eat every few hours. Ricky was dying and his eyes spoke that out so clearly that it was his time to leave. Ricky was euthanised and is at peace now. 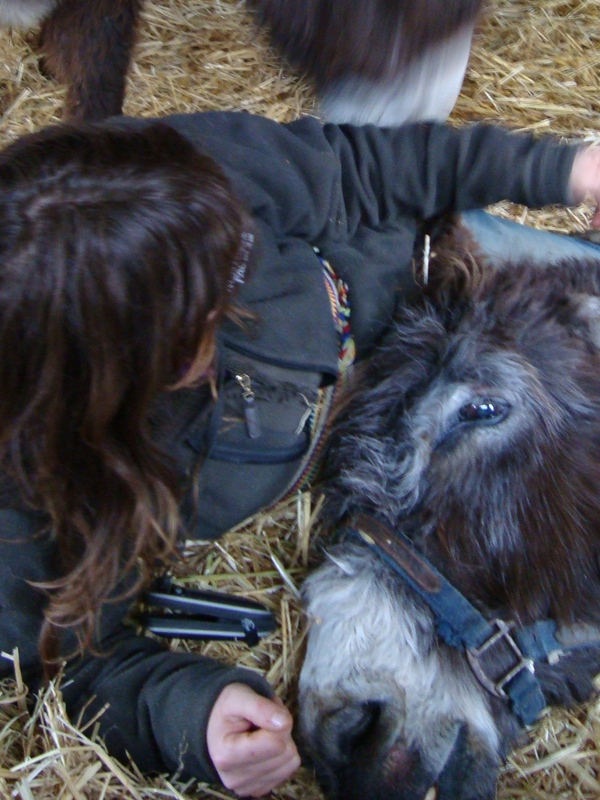 We will all miss him so much as he was such a beautiful gentle and loving little donkey.